When it comes to planning a great Halloween party, the most important thing to keep in mind is atmosphere. From the smallest to the largest party, guests are all there for the same thing, to have a good time! With the endless number of scary party themes, setting the right atmosphere is quite easy and is loads of fun. Choose a Halloween party theme to make decorating easier. With all of the great Halloween products available it can get kind of messy, so by choosing a main theme for the party it will keep you organized when shopping. Many Halloween tableware collections are available with coordinating decorations. When everything seems to "go together" this will give your party a more polished look. The invitation is your first opportunity to set the atmosphere for your Halloween party. A memorable invitation generates excitement in the recipient and will make your guests more apt to attend. Invitations should be mailed at least 2 weeks before your party date. If paper invitations seem too old-fashioned, create a Facebook event page and post regularly about the party. Guests can ask questions and get directions as well as see other guests that will be attending. The best part of throwing a Halloween party is decorating for it. Choose decorations that fit your party theme and when you think you have enough, buy a few more. "Over the top" is a good thing at Halloween! Take advantage of Halloween clearance sales throughout the year so when the time for the party comes you can focus on the decorating. Take your time! The best Halloween parties take weeks to set up. You will want to decorate indoors and outdoors to give guests as many visual displays as possible to get into the Halloween spirit. Make it a costume party! Nothing says Halloween more than getting dressed up in outlandish costumes allowing guests to be as wild as they want to be. For those "I forgot," or die-hard "won't wear a costume" attendees, supply them with inexpensive masks to get them involved. Be sure to have a prize for the best costume and don't forget to mention it in the invitation. Halloween trophy, party favors, and even baskets full of home-baked ghoulish goodies, all make great prizes. Halloween party games are great icebreakers, and will keep your guests interacting. Be sure to buy some games and activities to keep the kids busy while the Adults party. Get everyone involved and try Charades with Halloween themed subjects. Adult drinking games are lots of fun at parties, but always remember to drink responsibly. Be prepared for overnight guests who might have too much to drink or designate a driver so that everyone gets home safely. Have plenty of food and drink on hand giving your favorite recipes a spooky Halloween twist. Be sure to add some small props to the party food table such as plastic spiders, fake fingers, and assorted body parts. Remember that less is more when it comes to the appearance of food, so don't make it look too disgusting or your guests may not want to eat it. Set the mood for the party with Halloween music and spooky sound effects. Most popular music streaming websites have a playlist dedicated to Halloween during October, but if you have time create your own Halloween playlist with songs by your favorite artists. Spooky sound effects can provide some cheap scares and will give everyone the creep factor. Take lot's of photographs! Not only will you have memories of your party, but they are wonderful references for next year's planning. You will find that they will remind you of what worked and what didn't and will inspire you to make your next party even better. Photographs also make great postcard invitations to use for next years event. Have disposable cameras on hand for guests so they can get those "picture moments" that you might otherwise miss. Stage an area for guests to pose for pictures such a small graveyard or next to a life-sized prop. Make sure there is good lighting for the "photo "spot" as so often Halloween pictures are too dark. 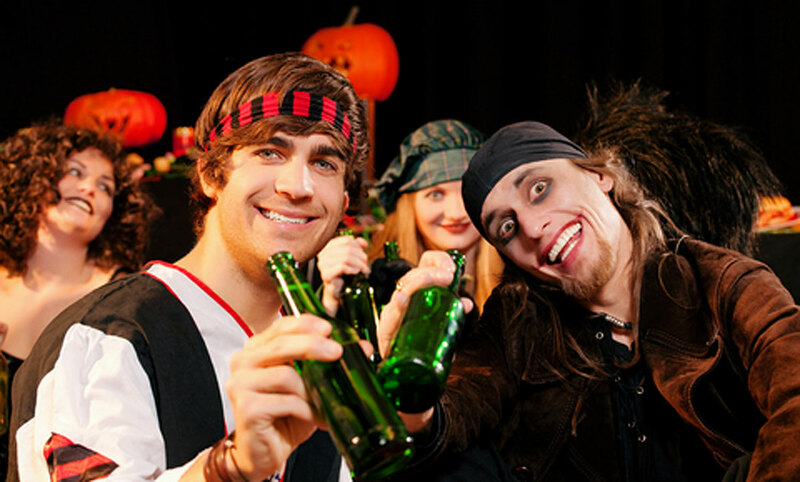 If you follow these helpful Halloween party tips, you are sure to have a great Halloween party!